When you plan to held an outdoor event, what’s the right size for the people capacity making comers comfortable? 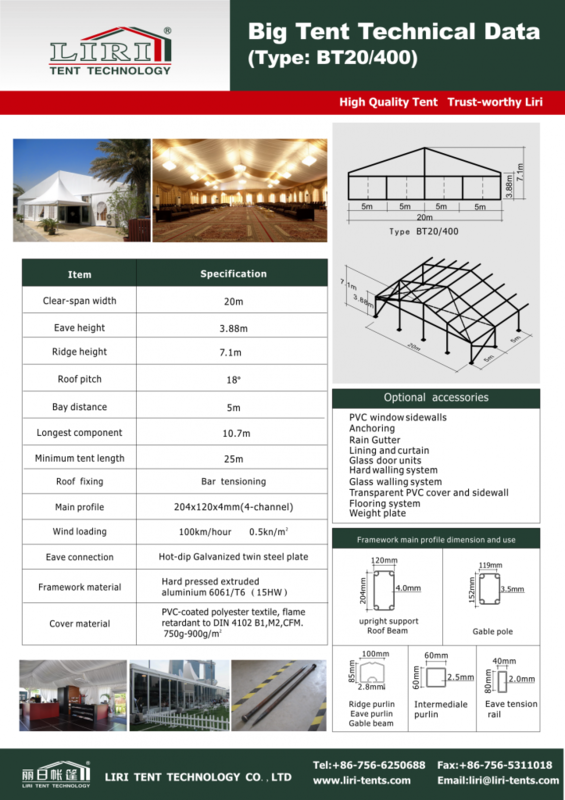 Take 800 people for conference, Liri Tent suggest the size 20x25m waterproof outdoor event tent with 4m side height. Thanks to modular structure design, unlimited increments in length by any 5m bay to meet larger people capacity meet. Like 20x30m, 20x35m, 20x40m…… Moreover, Liri Tent provide you different span width aluminum structure tent from 10m to 60m for your outdoor events. Optional accessories like glass door, glass or ABS walling system, interior decoration linings & curtains, wooden cassette flooring make your event luxury and high end.